Cake is critical to any birthday celebration and in this case, the cake is extra special..... a real push-the-boat-out, chocolatey, fruity, slightly sticky delight. The recipient (kindly) declared it was the 'best birthday cake' he had 'ever had'..... 'a triumph!' Ahhhhhh. Feeling creative, the intention was to make a flirt of a cake that would turn heads. Not over-perfect (I'm incapable of 'perfect'), but a bit of a looker with enough of a wow factor to show I had made a real effort. The result of my efforts is (if I say so myself) divine. It is not the sort of cake that you can knock up in a flash, but the effort required to make it is worth every luscious mouthful. A classic combination of chocolate (dark and white) with raspberry, the flavours are combined and complimented in layered sponges, sandwiched and smothered with white chocolate ganache and decorated and drizzled with fresh fruit and a vibrant raspberry-pomegranate sauce. Both sponges are made with melted chocolate (dark or white), moistened with ground almonds and greek yoghurt. 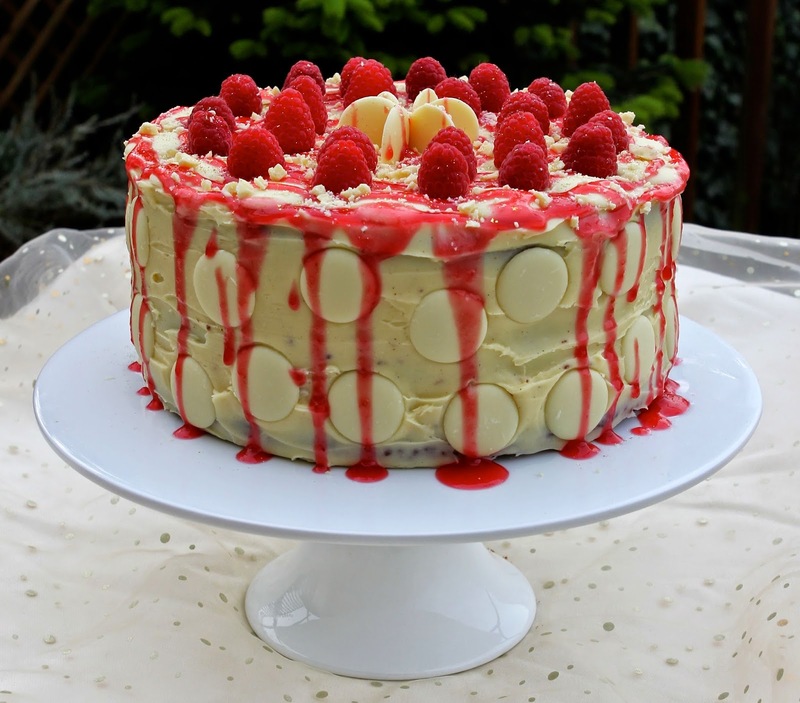 The white chocolate-raspberry sponge is flavoured (and naturally coloured) with a goodly dose of freeze-dried raspberry powder (sourced from Healthy Supplies). 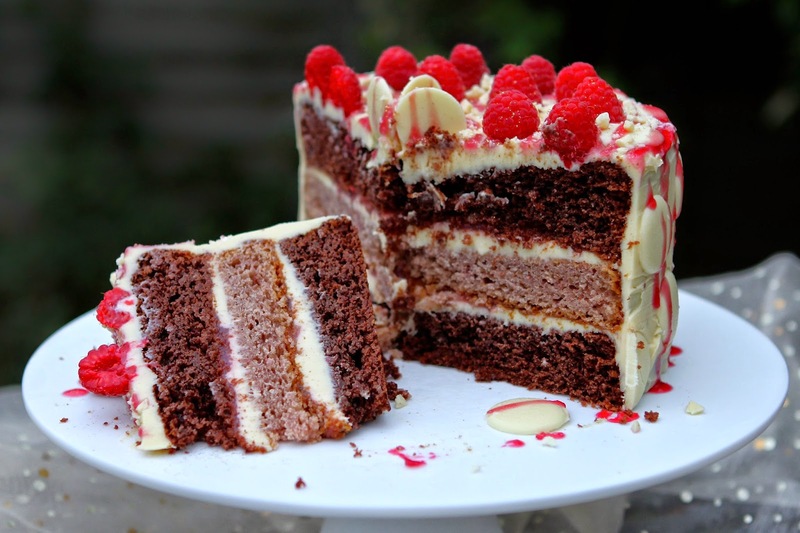 The result is a perfectly fudgy cake with a slightly dense crumb........ sweet with a slightly tart, fruity backdrop....... each mouthful mingling in a delightful partnership of taste and texture. And the sauce? What can I say? Made with juicy raspberries and pomegranate it is fresh, bright and contrasts the ganache with a slight sharpness to waken the tastebuds and liven the palate. Special indeed! My only regret? The weather wasn't great and as a result, the photos don't show this cake at its best. I had to zip it out into the garden to get enough light...... no consideration of 'styling', but a case of grab the camera and snap! Oh well.... I can vouch for its deliciousness. I am sending a couple of remaining slices over to Ness at Jibber Jabber for this month's Love Cake which for January is 'feeling fruity'. 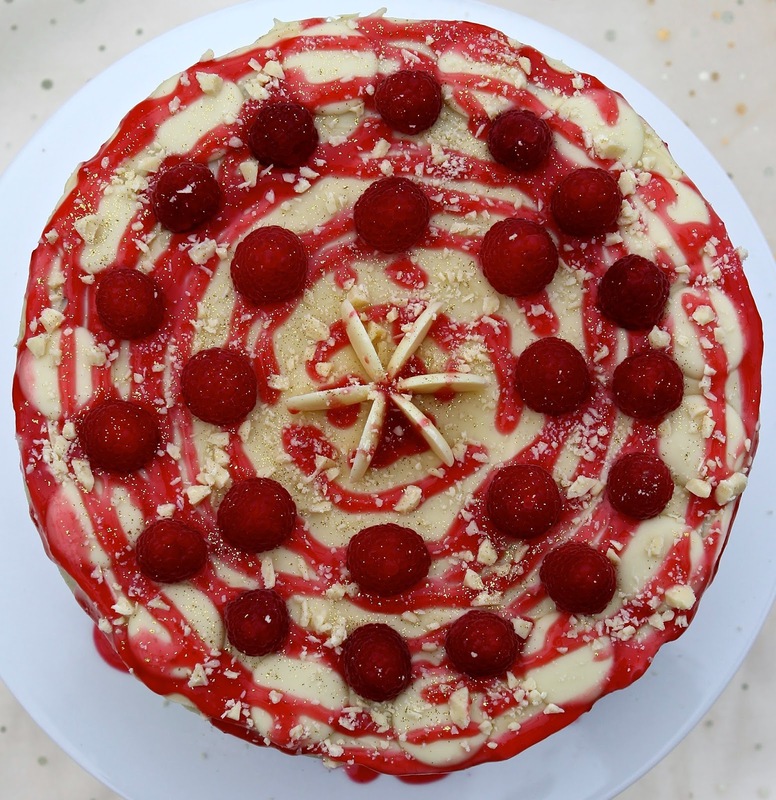 I know this doesn't exactly tick the 'healthy' box, but it's inclusion of freeze dried raspberry in the sponge, fresh raspberry and pomegranate in the sauce and the topping of fresh raspberries should hopefully allow its qualification. I am also offering to Cook, Blog, Share with Lucy at Supergolden Bakes. And finally to January's AlphaBakes with Ros at The More Than Occasional Baker (and Caroline Makes). This month's random letter is 'L'. This is clearly and most definitely a 'Layered' cake so I am sharing it as this month's entry. Base-line the cake tins with baking paper. Pre-heat the oven to 180 C/350 F/Gas 4. Melt the chocolate and butter together either in the microwave (medium setting - 30 second bursts - stirring between each), or in a glass bowl over a saucepan of simmering water. Stir together until well combined and completely smooth. Set aside. Mix together the almonds, flour, xanthan gum, baking powder, bicarbonate of soda, salt and cocoa or raspberry powder, making sure any lumps are completely broken down. Set aside. In a jug, mix together the milk and vinegar, stir and leave to stand for 10 minutes. In a large bowl, beat the eggs, sugar and vanilla extract until pale and beginning the thicken. Add the melted chocolate mixture and beat again. Add the milk mixture and yoghurt and beat again until smooth and well combined. Add the dry ingredients and fold until just combined. Be careful not to over-mix. Spoon into the cake tins and smooth the tops with the back of a spoon or spatula until even. Bake for 35 to 45 minutes until a skewer inserted into the centre comes out clean. Mix the water and cornflour in a saucepan until smooth. Add the sugar and fruit and gently heat, crushing the fruit against the sides of the pan with the back of a spoon and stirring until the mixture comes to a simmer. Stir and simmer for 2 to 3 minutes until the mixture becomes clear and thickened. Remove from the heat and push through a sieve to remove the fibre. Leave the sauce to cool completely. Break the chocolate into a bowl. In a saucepan or microwaveable container, bring the cream to a simmer. Remove form the heat and pour over the chocolate. Leave to stand for 5 to 10 minutes and then stir thoroughly until the chocolate has completely melted and the ganache is smooth. Leave to cool at room temperature until the ganache has reached a thick spreading consistency (this may take a couple of hours). Layer the cake sponges with a layer of ganache and some sauce (making sure you don't spread the sauce to the edge as this will dribble down the sides making it difficult to spread the ganache on the outside of the cake cleanly). Cover the cake with the remaining ganache, spreading evenly. 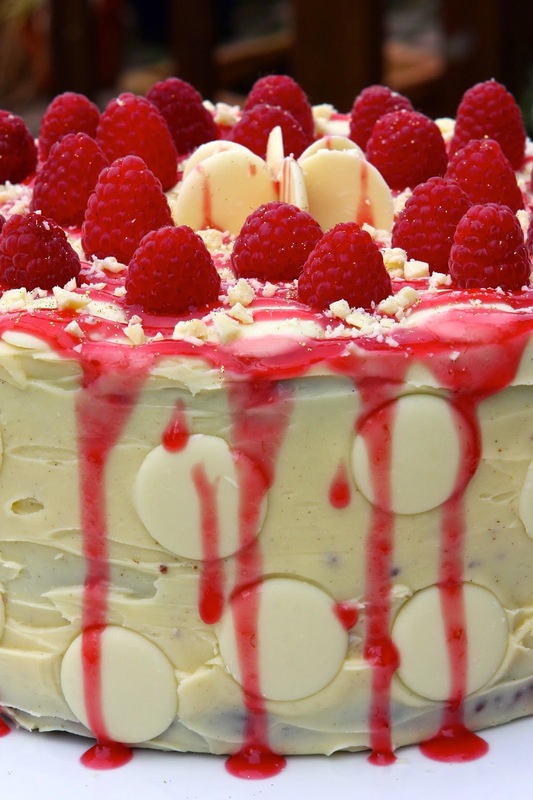 Decorate with white chocolate buttons, raspberries chopped chocolate and glitter. This cake should be stored in the fridge, but brought to room temperature before eating. Oh my goodness what a triumph! I've already gone back and looked at the photographs a couple of times. What a great idea to make separate layers from white and dark chocolate. Just divine! Thanks Ness. The layering was really special, especially since there was a clear contrast of flavours and not just colour! Wow it looks stunning! I love how you've decorated it. 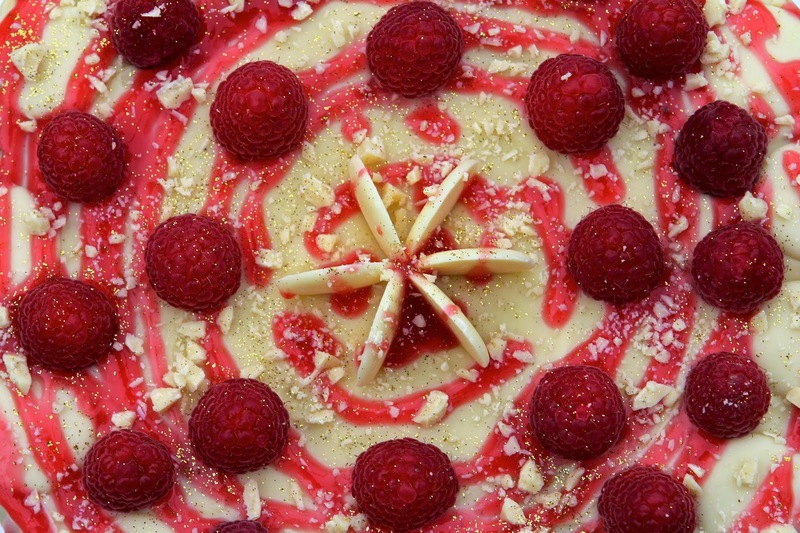 The raspberries and raspberry drizzle make it look so indulgent! I want to stick my fork in the screen. I'm sure the recipient was delighted. Thanks Katie. 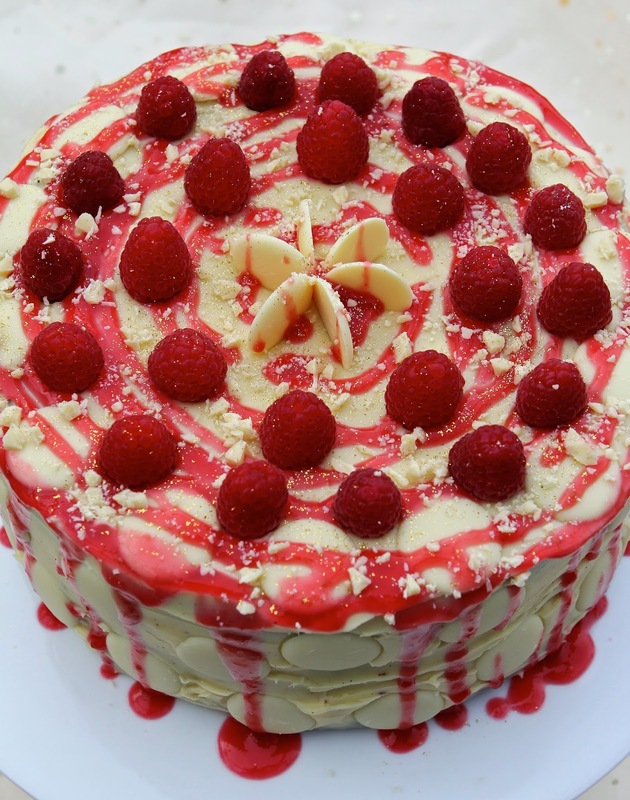 I too love the raspberry drizzle, especially down the sides of the cake. The recipient was very pleased! Wonderful, simply wonderful. You have created a masterpiece here Kate. A really delicious and stunning cake I would have loved to try a slice. You must have worked quite hard at making it but it was definitely worth it! Thanks Alida. It did take a while, but it was worth every bit of effort! Ooh er, Kate, this is simply wonderful. What a very lucky birthday boy. I would be over the moon if anyone made something like this for me, or even attempted it. It looks gorgeous and the flavours are glorious and with the different layers and colours it's so interesting too. Oh, I so want a slice. Wishing you a very Happy, Prosperous, Healthy and Fun 2015. I wish I could send you a slice Choclette, but sadly, it has long since been devoured. Shame.... it was yum! Oh well...... I can always make another one! What an absolute stunner! This looks gorgeous and you can just TELL that it also tasted amazing. Beautiful - thanks for linking to #CookBlogShare! Thanks Lucy. It was pretty special! Thanks Johanna. I will be honest...... None of us had any difficulty finishing it off despite the 'need' to indulge less! Such a pretty cake! Awesome that it is gluten-free too, amazing what one can do without regular flour! Wow that is a cake and half. I love the flavour combinations as I do like my fresh fruit in cakes. 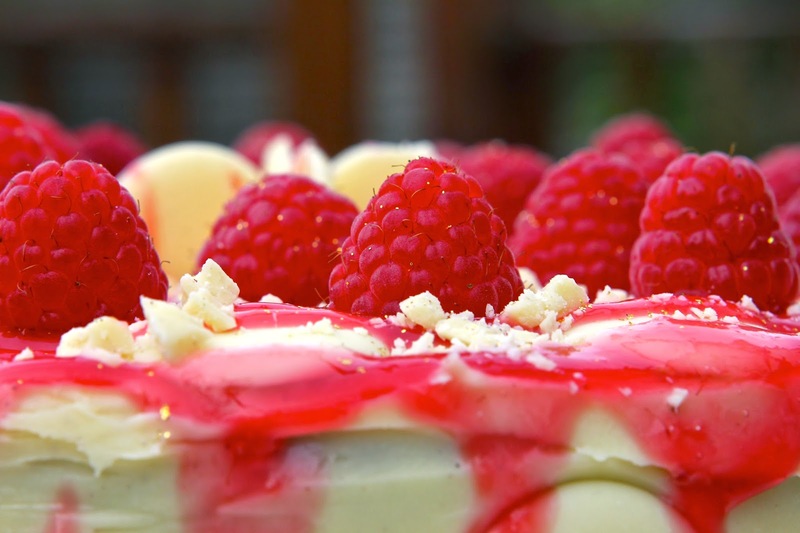 The raspberry pomegranate sauce sounds divine and the overall effect is stunning. 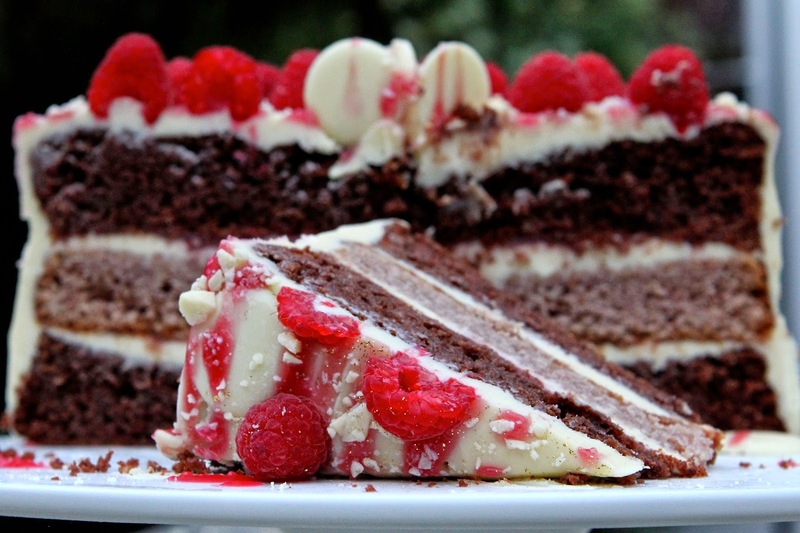 I've just baked a chocolate and raspberry layer cake but this looks much better! Thanks for entering AlphaBakes. Thanks Ros. I agree, fresh fruit always adds something a little bit special to cake.